Contains two 40-card decks, 8 game tiles and rules. contains 4 mini expansions for Alhambra; The Falconers, The Portals, The Building Sites, and The Exchange Certificates. 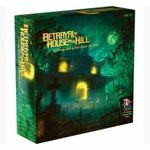 A game of exploration, suspense, and fear for 3 to 6 players. Includes 50 scenarios and dozens of rooms so no game plays the same twice!